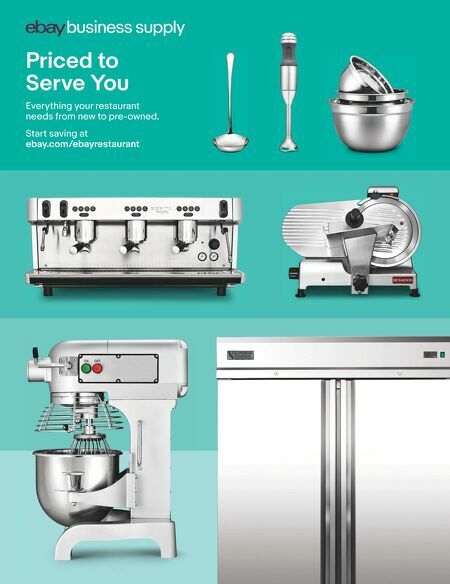 100 • FOODSERVICE EQUIPMENT & SUPPLIES • JULY 2018 market spotlight When co-owners Joshua James and Nicholas Campisano opened Clever Koi, there was nothing like it in the area. "Our background is primarily in Italian cuisine, but we wanted to create a nontraditional ramen concept that reflected history and explored the Asian side of traditional cooking," says James. The 86-seat Phoenix restaurant and 135-seat Gilbert location use an identical menu that includes Korean-style steam buns, dumplings, and both rice and noodle dishes. 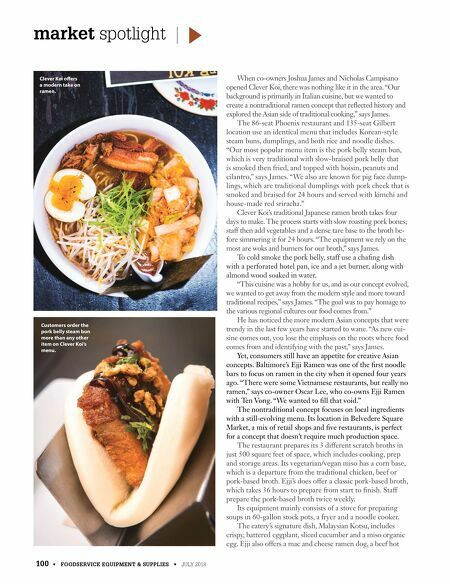 "Our most popular menu item is the pork belly steam bun, which is very traditional with slow-braised pork belly that is smoked then fried, and topped with hoisin, peanuts and cilantro," says James. "We also are known for pig face dump- lings, which are traditional dumplings with pork cheek that is smoked and braised for 24 hours and served with kimchi and house-made red sriracha." Clever Koi's traditional Japanese ramen broth takes four days to make. The process starts with slow roasting pork bones; staff then add vegetables and a dense tare base to the broth be- fore simmering it for 24 hours. "The equipment we rely on the most are woks and burners for our broth," says James. To cold smoke the pork belly, staff use a chafing dish with a perforated hotel pan, ice and a jet burner, along with almond wood soaked in water. "This cuisine was a hobby for us, and as our concept evolved, we wanted to get away from the modern style and more toward traditional recipes," says James. "The goal was to pay homage to the various regional cultures our food comes from." He has noticed the more modern Asian concepts that were trendy in the last few years have started to wane. "As new cui- sine comes out, you lose the emphasis on the roots where food comes from and identifying with the past," says James. Yet, consumers still have an appetite for creative Asian concepts. Baltimore's Ejji Ramen was one of the first noodle bars to focus on ramen in the city when it opened four years ago. "There were some Vietnamese restaurants, but really no ramen," says co-owner Oscar Lee, who co-owns Ejji Ramen with Ten Vong. "We wanted to fill that void." The nontraditional concept focuses on local ingredients with a still-evolving menu. Its location in Belvedere Square Market, a mix of retail shops and five restaurants, is perfect for a concept that doesn't require much production space. The restaurant prepares its 3 different scratch broths in just 500 square feet of space, which includes cooking, prep and storage areas. Its vegetarian/vegan miso has a corn base, which is a departure from the traditional chicken, beef or pork-based broth. Ejji's does offer a classic pork-based broth, which takes 36 hours to prepare from start to finish. Staff prepare the pork-based broth twice weekly. Its equipment mainly consists of a stove for preparing soups in 60-gallon stock pots, a fryer and a noodle cooker. The eatery's signature dish, Malaysian Kotsu, includes crispy, battered eggplant, sliced cucumber and a miso organic egg. Ejji also offers a mac and cheese ramen dog, a beef hot Clever Koi offers a modern take on ramen. Customers order the pork belly steam bun more than any other item on Clever Koi's menu.